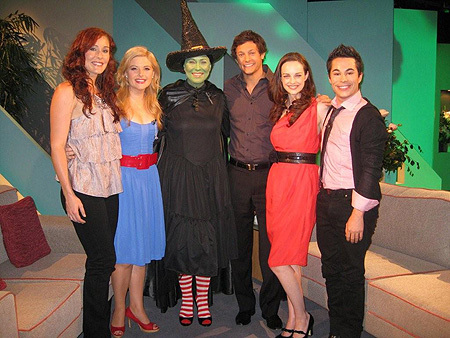 On this morning program of Mornings with Kerri-Anne Kennerley the entire show was devoted to WICKED and the land of Oz! The cast of WICKED performed two numbers – What is this Feeling? and Popular. Kerri-Anne interviewed some of the principal cast – Lucy Durack, Rob Mills, Jemma Rix, Penny McNamee and James Smith. And in a spectacular first, Kerri-Anne left her trademark glitz and glamour behind and became the Wicked Witch of the West. WICKED’S Kellie Ritchie applied the Elphaba green makeup for the transformation. Jamie Malcolm got into the spirit by dressing as the Tin Man too. A big thank you goes out to SATCH who dressed the WICKED cast members in theiroz-some attire. Check out the photos!